Bonnie Gaunt has been researching the Gematria of the Bible for nearly forty years. Her work has received world-wide acclaim. Here she reveals an amazing story that is hidden in the Apocalypse. It is a story that touches the lives of every one of us, because we are living in it. But Apocalypse need not be the picture of doom that some have supposed. It is a beautiful story of hope for a world that surely needs it. Today, with the threat of terrorists and the tragic loss of human life they have wrought, it is comforting to find positive assurance in the prophetic message that has been given to us - assurance that our world is in safe hands, and under the control of a God who has a magnificent plan for the ultimate joy of His human family. Chapters include: --The Apocalypse and its two groups of sevens --The Right of Rulership --The Sevens and Tens of the Apocalypse --Marching Around Jericho --The Treasures of Jericho --The Light of Seven Moons --No More Sevens --The Music of the Ages --The Pythagorean Comma -- the difference between vibrations per second in seven octaves and twelve perfect fifths, and more fascinating information! 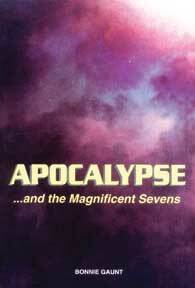 APOCALYPSE AND THE MAGNIFICENT SEVENS: An Exciting New Look at an Amazing Prophecy, by Bonnie Gaunt. 216 pages, 5x8 Paperback. Illustrated, references, and index.